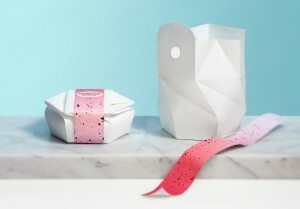 Tomorrow Machine is a Swedish design studio based in Stockholm & Paris, specialized in package, product and food concepts. Our vision as designers is to build a better world through research, new technologies & intelligent material. We believe in looking at science from a creative point of view to shape the innovations of tomorrow. We teamed up with the Berlin-based indoor farming start up INFARM to develop a never-before-seen indoor growing kit – so anyone can grow their own microgreens at home. 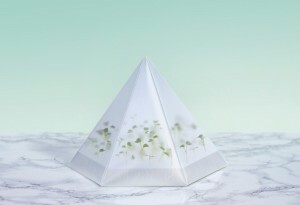 The Microgarden kit contains a reusable and renewable sheet of plastic which folds into a self-contained greenhouse. The Microgarden uses transparent seaweed based agar-agar gel as a growing medium, and it has many benefits. It allows the Microgarden to remain self-contained – which means you will never have to water the microgreens. Their roots absorb moisture from the gel. The clear gel also allows the home-farmer to see and experience the whole growing process, from when the seeds sprout to the roots growth. Gel of the agar-agar seaweed and water are the only components used to make this package. To open it you pick the top. The package will wither at the same rate as it’s content. It is made for drinks that have a short life span and needs to be refrigerated, fresh juice, smoothies and cream for example. What will the future bring? How will materials from our forests be used in 20 years? Innventia commissioned Tomorrow Machine to design 3 demonstrators inspired by Ekoportal2035, a vision of the future that has forest-based renewable materials at center stage. The demonstrators show the possibilities offered by Innventia’s advanced bio-based materials. The first item is a self-cleaning plate and cup made ​​entirely out of cellulose. 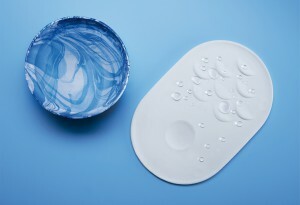 The plate and cup have a superhydrofobic coating and therefore rejects dirt, like a lotus leaf. This means that it never needs washing. A product that not only saves resources during manufacture, but also when it is used because it does not need water and chemicals to be kept clean. The transparent digital touch screen is made from nano-cellulose, which is a material that is optimal to use in conjunction with electronics, because of its conductive properties. The screen is transparent and can be placed in front of objects to photograph or explore them. This self-expanding instant food package combines different aspects of sustainability. It saves space in transportation by being compressed – at the same time as it is made out of a 100% bio based and biodegradable material, invented by Innventia. When pouring hot water into the package the mechano-active material will react to the heat and transform from a compressed package to a serving bowl. 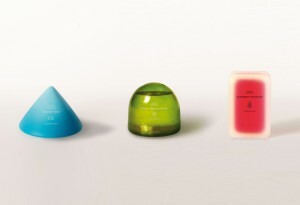 This is the new generation of sustainable package design, using materials that are both smart and environmentally friendly. A package that opens itself when the temperature (in the oven) is just right and the food is ready to be served. We have looked at biomimicry and studied shapes that are self-opening in nature. The project is a collaboration with Swedish research company Innventia. The product is made from a mechano- active material that will change shape when exposed to high temperature. The material is made out of 100% biobased and biogradable material invented by Innventia.